The holidays are over, but one song is still playing through my head: All I want for Christmas is you. Because your participation – above and beyond what you’re already doing – is what we most want here at the Conservation District. Probably you are already doing something to steward our natural resources – maybe you plant native shrubs for the birds, maybe you build soil health by cover cropping or maybe you volunteer picking up roadside litter. Thank you, and we are making progress. At the same time, everyone would like to see faster progress, and everyone can see something that someone else should be doing better. 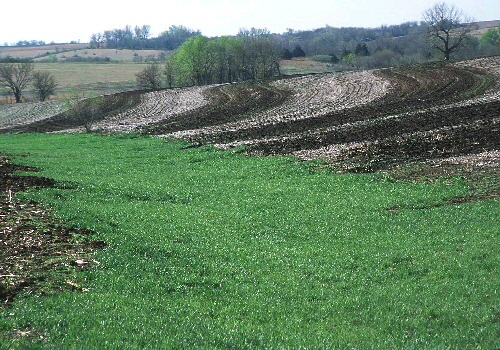 Grassed waterways prevent gullies in crop fields. Lakefront trees don’t always block the whole view. Often there are clear benefits for you in addition to cleaner water, like better bird watching or easier maintenance of your driveway. Sometimes these projects also require a change of perspective. For example, my aunt loved her clear view of the lake from her camp, but five years ago she agreed to plant a low buffer of blueberry bushes and other shrubs. Now she picks berries from that buffer with her grandkids, and her lake view is framed by leaves and flowers. In a similar way, many farmers have changed their vision of a perfect cornfield from one with impeccably bare soil between the rows to one protected by a cover crop and residue from the previous year. Our State has allocated substantial taxpayer money to clean up our waters, but money can’t buy us further improvement without community members participating on their land. At the Conservation District we can connect you to the experts or information you need to undertake any of these projects, and often funding, too. To help you take advantage of the broad array of opportunities available, the Conservation District will be launching bi-monthly email updates this year for people who opt in. We will share information on workshops (think topics like driveway maintenance, septic solutions, tree care, or wildlife tracking); programs that pay for conservation work on your land; volunteer opportunities; availability of new data; and opportunities for public engagement in clean water policy. So I ask everyone to consider – what more can you give this year to improve the health of our community’s natural resources? Because all we need this year is you.